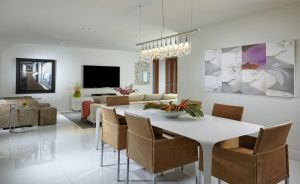 Miami interior designer, J Design Group, provides opulence from the kitchen to the dining room. Our company is known as the best interior designer in Miami, as we transform our clients’ dreams to an immaculate reality. Customer satisfaction is paramount to our success. Our “About Us” page provides a brief description of our process. “One of our primary responsibilities as interior designer and decorator is to focus on all of the key elements,” the site describes. Having a sophisticated kitchen is a must for many of our clients. They want to have the best tools and an impressive design for frequent usage. This is important because, for many of our customers, they spend a considerable amount of time preparing food and eating, whether it be for a glorious weekend brunch, dinner on holiday, and more! One of the most common requests for our clients is a beautiful kitchen. Owners of the home take pride in their location and want to have a sophisticated space when company comes to dine. For instance, on special occasions, such as Mother’s Day, our clients love to prepare an excellent meal for Mom. For a family with two young children, having them join in the cooking is a memorable experience. Mom’s favorite food is salmon and vegetables, so the husband enlists his kids to help him in the kitchen. His wife loves spaghetti but is on a diet, so the husband has his children use the “Veggetti,” while dad grills the salmon. Having a functional kitchen is important. However, once the pieces are acquired for the kitchen, it is necessary for this portion of the home to have Feng Shui that inspires positivity and love. We take great pride in making this part of the home a place of refuge and achievement. “It makes a lot of sense to make this area of your home, a place of joy for all family members,” are site provides. When designing the space, our interior design agency in Miami does not believe in imposing our ideas on the client. It is fantastic when customers reach out to our company, and they describe with optimism how they want the space in their home to look. Often it is a general idea, but through our interactive process, where we provide scrupulous service, we find out the specifics. These personal touches are what makes the space such an excellent place to occupy. “[O]ur philosophy is to work cooperatively with our customers and build a design solution that is in line with their vision and taste,” our site provides. How we accomplish this feat is by encouraging the participation of the client in each phase of the planning and implementation of the kitchen design process. 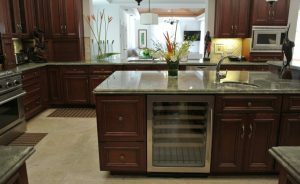 “Our kitchen design solutions have earned us a reputation in the design industry for being the best in transforming client’s dreams into reality,” our site continues. Our team of professionals helps our clients choose the most effective kitchen elements, based on their unique ideas. These actually make the space unique, one of the reasons we are the best interior designer in Miami. Our Miami interior design firm helps create memories, from the kitchen to the dining room. Continuing with our example, once Dad and the children complete cooking the meal for the evening, it becomes the time to take the scrumptious plates to the dining room for consumption. As the husband brings the dishes from the kitchen, the children are eagerly waiting to devour their food, while Mom has a sparkle in her eyes — she is truly being appreciated. The husband serves the plates in from of each person. One of the reasons we excel in the presentation of the dining room is that during special occasions, such as Mother’s Day, we have designed the room to coexist with the other rooms in residence. This means that the room has a subtle excellence that does not stand out — like a shock-jaw presentation — because everything is balanced. This is imperative because this is one of the most significant elements of the residence. “When we design any dining room, our focus is on picking the perfect dining table and chairs that will complement the living and other adjoining areas of your home,” our site provides. 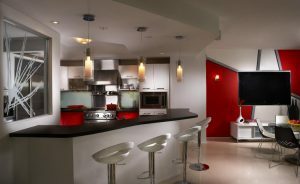 We are one of the best interior design agencies in Miami. Our team of professionals is passionate about everything that has to do with the interior design. They are always networking and studying the latest trends in interior design. For more information about our company, we encourage potential customers to speak to one of our expert interior designers to make your dream into a reality. To ensure that the project is on the most efficient track, we also offer free consultation from our team at J Design Group. To chat with a member of our company, please call (305) 444-4611. Potential customers and current clients can visit our headquarters in the beautiful Coral Gables. During non-working hours, we recommend visiting our blog where we provide a wealth of useful information.